A new spin on water slide design, The Rampage! Lets you slide up and down for an all around great time! Perfect for backyard parties, company picnics and corporate events. 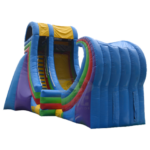 The 21 ft Rampage is an 21 Ft wet/dry slide. Rents for $325 weekend. Daily rates available upon request.